I've realised that every time I knit something for my Mum, it's pink with love hearts. I'm really not a pink with love hearts kind of person but I seem to do this unconsciously when knitting for Mum. It has a bit more slouch than she wanted (I think my gauge was off...I didn't check). Here is the link to my project page. 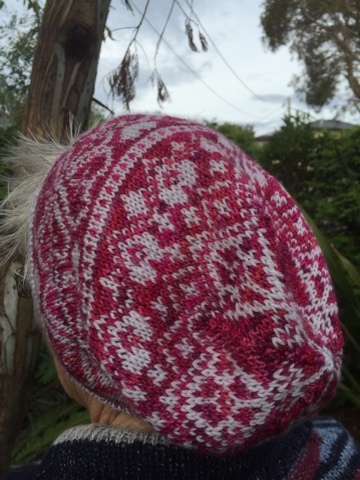 She told me that she is going to wear it to the Bendigo wool and sheep show later this month so that everybody assumes she is an awesome knitter! I would love to see more photos of this one, maybe a close up of the heart detail.